We have a secret to share with you. For the last year, we’ve been traveling around the world to learn from the next generation of subscription leaders. From Sydney and Hong Kong to Tallinn and Chennai, we’ve met with companies in the emerging subscription capitals that will define the market in years to come. This is one part of a larger effort we’re debuting in 2018. We’re making a major commitment to sharing stories and learnings from the subscription trenches you can’t get anywhere else. Even though we’re incredibly excited to share our work, we want to make sure that we’re on the right track. To that effect, we’re creating an exclusive group for our readers to have a major say on the direction of our work while getting a sneak peek at some really exciting new content. 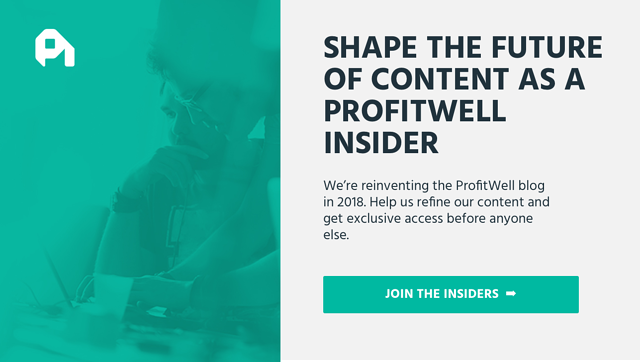 If shaping the future of the ProfitWell content sounds intriguing, sign up below and we’ll be in touch.